Someone once said that if the British stopped drinking beer, our entire economy would collapse -- and we’ll admit that’s a totally plausible scenario. 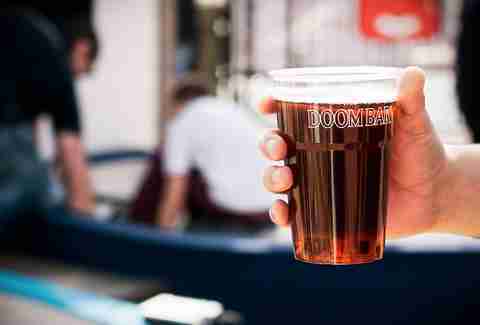 We do love our pints, and have been known to knock back two (or 10) with the best of them. So it’s a good thing there’s a lot of good, local liquid coming our way. British breweries seem to be multiplying like rabbits, so we’ve sorted the best for you to try. Rumor has it that Sharp’s original brewer, Bill Sharp, started with a home kit in his garage -- because his wife didn’t like him going to the pub. After a couple of decades slowly gathering steam, this Cornwall-bred beer has found crazy success across the country -- and even the world. Mainly found on tap, there’s a little bit of controversy about the bottled version, which is not bottled in Rock, Cornwall -- as previously thought -- but rather, at Burton-upon-Trent, a full 267 miles away. This cultish beer is a bit on the bitter side, but it’s also malty and hoppy, with notes of dried, dark fruit. These Welsh brewers are mavericks. Ditching any pretense of being traditional, they went in a wholly new direction -- as evidenced by their clean, modern look and feel -- and are constantly pushing to see how far they can take their brews. The O8 is the continuation of an idea that started with the original O1 amber ale. Taken a few steps (and percentages) further, O8 pushes the flavour toward big and bold, with an intense sweetness, alongside subtle notes of pepper, smoke, and leather. What started as three guys in North London making a bit of beer has turned into a multi-million pound venture. Camden Town now produces around 12 million pints a year -- and recently sold a large share to the big guys over at InBev. The beer that made its name is the Hells Lager, which is similar to the German-style “helles” pilsner (“hell” means “light” over there). This one’s gentle, with the hopping of a helles, resulting in a crisp, clean beer that you can easily knock back for hours. Everyone has that one friend who just doesn’t like beer. Instead of abandoning ship, have them try this raspberry wheat beer from the Greenwich brewery. Similar in taste to a lambic (it has that sour, fruity thing going on), but when you first smell it, all you get is pure raspberry. There’s no added sugar here, so it’s not like drinking a soda -- and it’s still made with barley and yeast, so you get that bit of delicious malt. 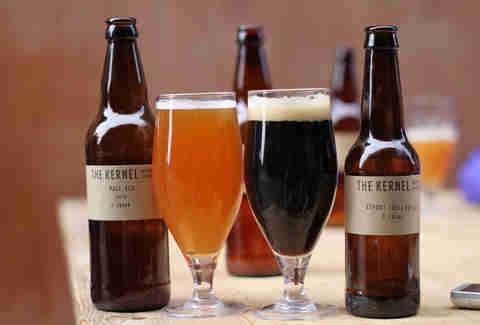 The Kernel has been one of the big leaders in the Bermondsey craft beer scene for a while now. Housed in one of the railway arches, it's released a bunch of different IPAs, each with their own unique quirks and ABVs -- all of which are available at different times. Saturday sessions used to be held at the brewery, where you could hang out and drink where it was all made, but the idea started to outgrow itself, and the brewery recently scaled back into just operating a bottle shop instead. The oldest independent brewery in Sussex, Harvey’s has pretty much become synonymous with its blue-labeled Best Bitter. Seen in pubs across the country, it’s a pretty classic, full-bodied bitter, with a good amount of hops and a dry finish. This classic started life in 1955 and has been carrying on the tradition ever since -- even picking up a number of awards along the way. 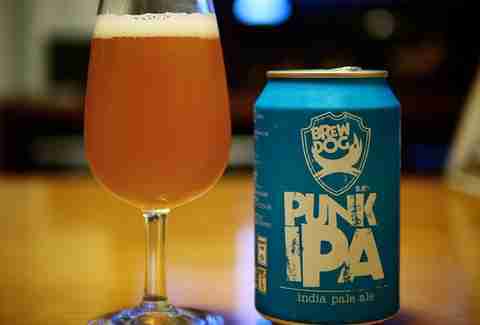 If The Clash were a brewery, they’d be BrewDog. Started on the premise that the big guys have been ruining beer, BrewDog wanted to make something unapologetically fantastic. 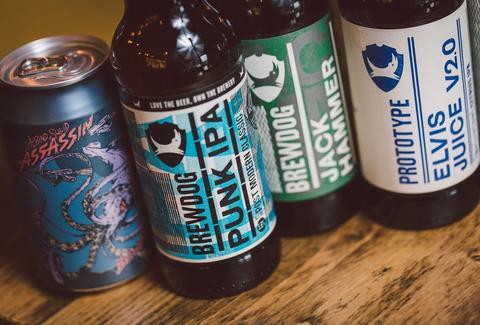 So it introduced the Punk IPA: loaded with six different hops, this brew is a delicious assault on your taste buds, balanced by sweet notes of tropical fruits and caramel. What started in 1994 as a drunken idea scribbled on the back of a beer mat in a Brighton pubhas now grown into the second-largest brewery in Sussex. The Dark Star Brewing Company (the name is a reference to a Grateful Dead song) turned out over 20 different styles a year, including Crème Brûlée, Revelation, and the award-winning Espresso. The Hophead is an unsurprisingly bitter brew that transforms into something more light and zesty the more you drink it. Peter Austin, who is often credited for kick-starting the modern British craft beer revolution, founded Ringwood in 1978. The brewery has a long history of trying out bold flavours and creative concoctions. 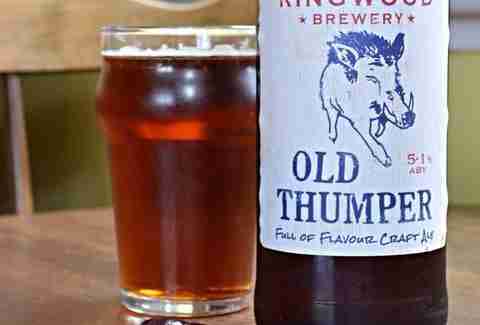 The Old Thumper, which boasts the tagline “A Beast of a Beer,” has a serious following among people who love its warm, malty flavour, plus fruit notes and a bitter finish. The last family-owned brewery in London, Fuller’s launched the London Porter in 1996 with an aim to reignite interest in what was once a working man’s classic beverage. Having won a slew of awards, including World's Best Porter at the World’s Best Beer awards in 2011, it’s safe to say this bitter, chocolatey pint of liquid goodness is here to stay. 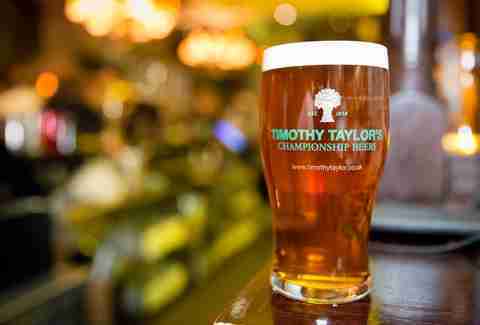 Family-owned for over 150 years, Timothy Taylor produces the classic Landlord, which had some serious media buzz back in 2003, when Madonna said it was her favorite beer. This pale bitter is an easy-drinking favorite, and has won both CAMRA’s Champion Beer of Britain and the Brewing Industry Challenge Cup -- four times. Deep golden in colour, this beer offers flavours that lean towards the crisp and citrus. It doesn’t really have any malt flavors, and comes off a little hoppy, with a very dry finish. This Scottish brewery does things a little differently. Starting with an Old Ale-style beer, it takes things up a notch by aging it in oak casks that formerly held Highland Park 16-year-old single malt Scotch. This lends the brew some aspects of a stout, without much of the heaviness. 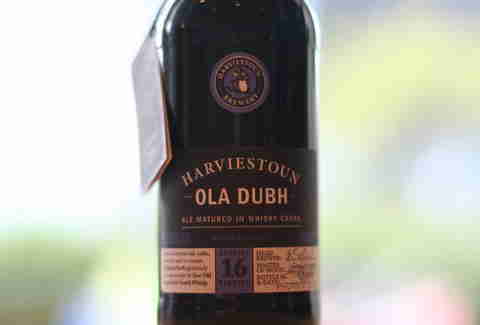 The subtle flavours of roasted malt, vanilla, and coffee, plus hints of smoky peat, make Ola Dubh 16 a very unique sipper -- best had around room temperature. Haley Forest is a food and booze writer who loves beer with ice cream, and believes if you haven’t tried a Guinness Float, you haven’t lived. Follow her at @HCForest.